This summer I was so lucky to spend some time in Black Mountain, North Carolina. The air is so crisp, the trees so green and the lifestyle so relaxed. Three of my college girlfriends met me there and we enjoyed a relaxing few days of catching up and having some "mountain" time. One of the days we stumbled into the sweet little town of Black Mountain and had lunch. After lunch we were looking in the stores and came across a card store. Three of us ended up in front of one particular line of cards. We read every card. The illustrations were chilling and entertaining at the same time...the words that went with the drawings were so deep, so real and so touching. I actually sat down on the floor and read every card in the store...and started a stack to purchase. Something about this artist was different. The cards could tell your story. Something about the message was so raw, so touching and so personal. I stand, I reach, I yearn, I bellow, and finally I live. When I got home, I googled the name of the cards "Pondering Pool." The artist was a woman named Susan Mrosek in Arizona. I decided she needed a bracelet. Her cards felt like a person that was in the Healing Knots circle...and maybe, just maybe, she would email me back. as though you were a gift. I sent her a note telling her my story about finding her cards and loving them. And I shared my story of Healing Knots. It was amazing...she wrote back. Her note was humble and thankful. She shared that we had something in common...that her company had also been inspired by losing her "soul mate" and sister. That both of us had art that was created straight from our hearts. like and elegant Sunday brunch. She wrote, "I love the idea of prayer bracelets! You're right, we definitely have in common the making of art from the heart. 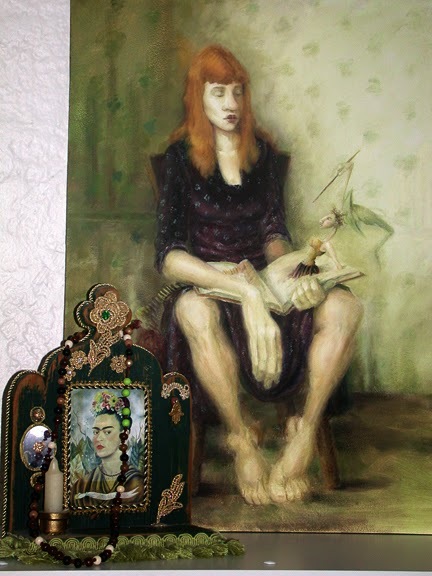 A large part of my art is tied to healing from my sister's passing. She was my soul mate and muse, and is woven deeply into Pondering Pool, as well as my life." This is where I begin to feel a larger force in this mission of Healing Knots. How could it be that those cards gave me this feeling of deep love, caring and connection? And that I reached out and she reached back?? This is where we can still love people. When you feel something...speak up. Send a note, make a call...your journey is filled with others that have the same experience. It just takes that moment of offering your hand...and a heart connection is made. "Fourteen years ago, after some prodding, I took a leap and created a line of note cards, posters and a book called Pondering Pool. It turned out to be very cathartic, not only for me (and my sister/collaborator Diane Hope), but much to my surprise, people throughout the world. Its sweet characters are quite imperfect, funny, brutally honest, and in various stages of struggle and healing. They thoughtfully tell us that being different is not a flaw, but a blessing. Diane Hope passed away July 31, 2008. It's important to me that people understand how much of the Pool is filled with Diane's heart and muse (it's not the same in here without her!) 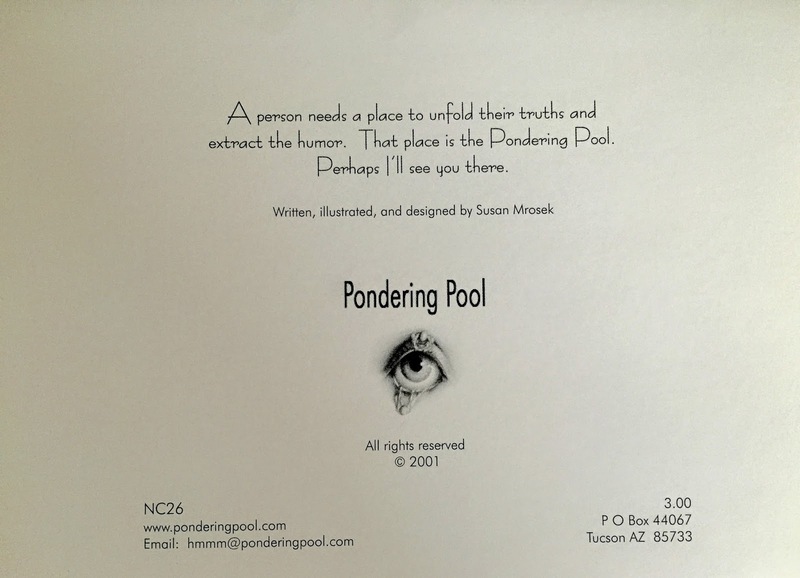 In fact, Pondering Pool was born, for the most part, in Diane's living room, kind of sideways, as a byproduct of the way she and I dealt with our challenges. How grateful I am for the heart filled years we spent together in the creative frenzies, celebrating every detail of each other's works, and laughing like we were dying from the joy of each other - we couldn't get over us. Because of her severe OCD, Diane was unable to take her own uniquely healing artwork public. I intend to publish her works one day so we can finish what we started, she and I helping others to laugh and heal. If Diane and I make up the heart of the Pool, my partner Bill is definitely the spine that keeps it afloat. He, too, is my muse as well as a magnanimous fortune giver, fully equipped, sometimes overstated, powerful as the wind clearing a storm." Thank you Susan for all of your art. You are sharing so deeply and making beautiful expressions that speak to so many of us. Your sister is smiling down on you and Pondering Pool! Your story reminds us all to live from the heart!